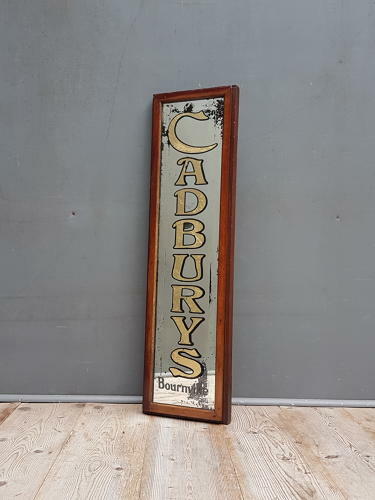 A beautiful early antique advertising mirror for Cadburys Bournville Chocolate. A wonderfully decorative & very rare survivor featuring a thick glass mirror plate embellished with beautifully detailed gilt lettering & set in its original solid mahogany frame. An absolute stunner. Wear commensurate with age, good overall condition, no damage, displays beautiully. The mirror once formed the rear panel of a late 19th century shops adverising cabinet and the rear & sides recesses where the cabinet hinges once were have been neatly filled at some point. UK courier service available at £15 trtacked & signed for 24 hour delivery.